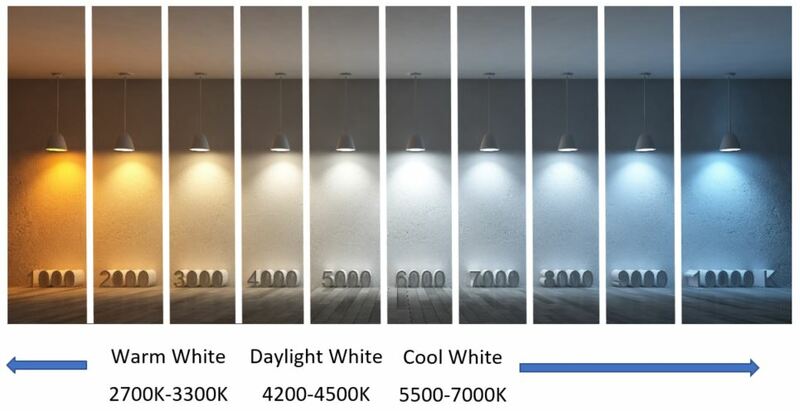 What is Color Temperature (CCT)? While all led corn lamps uses white light sources, some of these sources have a warm hue (more yellow), others have a cool hue (more blue). This variation in yellowish or bluish hue is what determines color temperature. Color temperature is expressed in degrees Kelvin (K). A warm white light might be 2700K – 3000K. A cool white source might be 4000K to 4500K. See the chart below for examples of varying color temperatures. How do you select landscape lighting color temperature? 2700K: Most commonly used in landscape lighting (very warm and welcoming). 3000K: Preferred by some because they like the cooler look especially when lighting vegetation. 4000K: Sometimes used for downlights from trees, because it is similar in color to moonlight. Others prefer warmer colors for those lights. 2200K: Very warm (similar to candlelight) and can be used for special romantic effects in patio or deck settings. This light is also close to the color of sodium lamps used in some streetlights – so designers may want to match that effect. If incandescent (filament-based) lights illuminate a scene, you will perceive (among the lit objects) certain colors and hues. If you change the light source to a non-incandescent type, you may find that the colors and hues look different. The ability of a light to accurately render colors and hues (compared to incandescent lighting) is called the color rendering index (CRI). A perfect CRI would be 100. Most high-quality LEDs have a CRI of over 80. CRI‘s less than that should be avoided. Unlike older incandescent and fluorescent lights, LEDs do not typically burn out. Instead, they diminish in light output over time. That‘s why LED lamp life is determined by how long it maintains a useful light output. The most accepted measure of when the LED has reached the end of its useful life, is when the light output has diminished to 70% of its initial output. This is termed L70. Keep in mind that L70 is a predicted time based on the estimated temperature of the LEDs during operation. If an LED operates in a poorly designed fixture, it may overheat and diminish in brightness relatively quickly. There are also other factors concerning the components of the LED driver that may cause premature failure of the LED. Wattage: The energy consumption of the lamp or fixture. This is what is recorded on your home‘s electrical meter and what appears on your electrical bill. Amperage: Indicates the strength of the electrical current required to power the lamp or fixture. Important for larger systems so that wire sizes and transformers can be chosen correctly. Power Factor: This is a value (from 0 to 1) that arises from the behavior of the LED driver circuitry. It affects how wires and transformers are sized. Higher power factors are preferred to lower ones. But this is not a useful value to compare lamps & fixtures. VOLT-AMPS: This is the value obtained by dividing the wattage by the power factor. It is used to determine wire and transformer sizing.